Hallstatt  is a small town overlooking the Hallstätter See (Lake Hallstatt) in the Salzkammergut, in the federal states Upper Austria of Austria. The Hallstatt-Dachstein Salzkammergut area has been added to the UNESCO World Heritage List with the following inscription: "Human activity in the magnificent natural landscape of the Salzkammergut began in prehistoric times, with the salt deposits being exploited as early as the 2nd millennium BC. This resource formed the basis of the area’s prosperity up to the middle of the 20th century, a prosperity that is reflected in the fine architecture of the town of Hallstatt." Hallstatt was the site of an early Iron Age culture from 800 to 400 BC, which is known as the Hallstatt Era. Hallstatt is considered to be the oldest still-inhabited village in Europe. In addition to its ancient history, Hallstatt is spectacularly picturesque, due to its location on a narrow rocky west bank of the Hallstättersee with the sheer rising mountains behind it. Considered by some to be one of the most beautiful places on earth, Hallstatt is sometimes called "the pearl of Austria". Note: during the "off season", few shops and restaurants are open, and in some periods it might even be difficult to find a place to stay. Advance reservations would help ensure acceptable accommodations and avoid a worrisome search for an open hotel. From the main line between Salzburg and Vienna, get off at Attnang-Puchheim. Take a train from here towards Bad Ischl and Obertraun. The Hallstatt station is south of Bad Ischl and one stop north of Obertraun; it is on the east bank of the Hallstättersee (Hallstatt Lake) and consist of just a boat dock next to the tracks. A regular ferry service will meet each arriving train and take you to the town across the lake. One of the best views of Hallstatt is from this ferry ride across the lake, especially in the morning when the sun is shining on the town. When leaving, the boat takes you back to the tiny train station, where you may take the train back to Attnang-Puchheim and transfer to your next destination. The boat meets each train leaving the station, and the schedule is posted at the boat dock, or it also is available at tourist information. The tourist information office can provide further information about train schedules since the train station itself is likely unmanned (and it is across the lake). As of 2017 you cannot buy the ticket on the train anymore, you must buy it at the station using the ticket machine (accepts cash and major cards). Once on the train, ask the conductor if he/she knows the platform number of your desired transfer (don't worry, all train employees speak English), or check the departures screens when you get to Attnang-Puchheim. But be prepared, the transfer may be fast, as Attnang-Puchheim is not a big station, and the passing trains will not stop for long. CK shuttle  and Budweis-shuttle  offer a door-to-door transportation service from Český Krumlov to Hallstatt and back for 950 CZK (36 EUR) pro person. The ride takes about three hours. A street passes through a tunnel in the mountain above the town. There is underground parking available here. 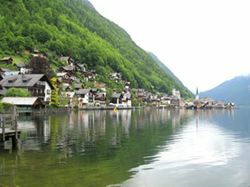 White Alligator Tours  offers Small-Group Guided Day Trips from Vienna to Hallstatt by minivan. The full-day tour includes other areas of the Lake Region also and costs 129 EUR per person. Walk. There is only one road through the town; and automobile traffic is usually not allowed May to October, 10 am to 5 pm, when Hallstatt is essentially car-free. You can easily walk from one end of the town to the other in about a half hour. Cultural Heritage Museum. A small but interesting museum displaying 7000 years of Hallstatt history. Beinhaus. "Bone House" in English. Due to the extremely limited space in the cemetery, burials are only temporary. After 10-15 years the grave is opened and the bones are removed and bleached in the sun. Then they are stacked in the Beinhaus. It's not as gruesome as it sounds. Skulls are often decorated with painted flowers and the family name. This practice was stopped in the 70's with the approval of cremation by the catholic church - you will see that those who remain buried all have recent dates of death. See the town. Simply enjoy the peace and quiet of the town. Have lunch in a cafe next to the lake and feed the swans. Window shop. Visit the salt caves. Hallstatt Salt Worlds will take you into the more than 250 year old salt mines to explore its underground beauty. Hiking. There are many hiking trails in the mountains behind Hallstatt and throughout the Salzkammergut area. Ask at the Tourist Information office for a good hiking map as it can be easy to get lost in the rapidly changing alpine weather. Children. There is a very nice lakeside playground about 500m south of town with free WC, swimming, sunbathing, and the best views of town you'll see without going on a boat. Ice Caves, Mammoth Cave and 5 fingers lookout. In Dachstein, across the lake from Hallstatt, there are caves with ice waterfalls, lakes and ponds streaming through the limestone. Be sure to bring a jacket or sweater. 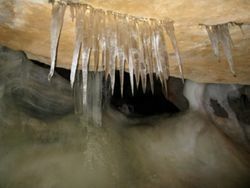 From from 1st June until 30th September 2012, travelers can buy a UNESCO World Heritage ticket  which costs 31 Euro and can be used for the ice cave and a boat trip across the Lake Hallstatt. Once you're up the mountain, do not miss the 5 fingers lookout offering a unique view of Hallstatt and its surroundings with an extra bonus of adrenaline rush once you step on the glass-bottom platform and see the depth below you. The restaurant in Gasthof Zauner has very good local fish on the menu. The local Fassbier (tap beer) is from Salzburg: Stiegl. This is available throughout Austria, however. A more interesting regional beer to try is "König Ludwig Dunkel Brau" (King Ludwig Dark Brew) which is not as widely available, although you will find it also in Tirol, to the west. Stop by the local grocery store "Konsum" (technically located in Lahn) to check out the local selection of beers and wines without paying restaurant prices. It seems that almost every family runs a Bed & Breakfast. Find one high on the hill with a good view of the lake and valley. The sight of the lake at dawn is not to be forgotten. Also try Obertraun, directly opposite Hallstatt on the lake, it is easily reached by ferry or train. The village offers good quality accommodation at cheaper rates, try the Obertrauner Hof in the centre with good access to shop, bank, tourist office etc. Many are listed at . Prices start at 20€ with breakfast. Automatic online booking is rare. This page was last edited on 5 April 2019, at 14:08.